This is another short comedy from Edison that uses still photography as the set up for a simple joke. In doing so, it seems to comment on the nature of “looking” and voyeurism. We see an outdoor location, apparently in a park. There is a bench to the right side of the screen. 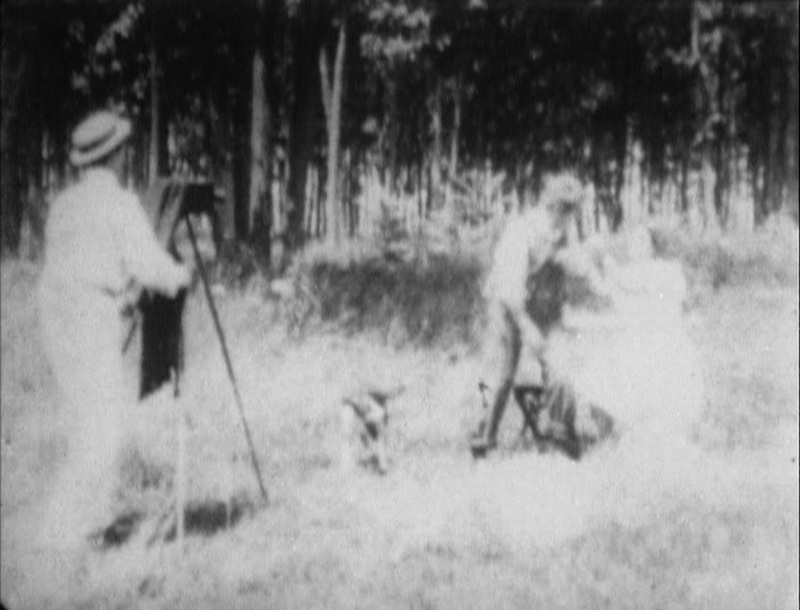 A man carrying a camera and wearing a straw hat walks toward the camera, and the “couple” enters from the left. They are an unkempt man in overalls and a young girl in a summer dress. The cameraman convinces them to pose for a photograph, and they arrange themselves on the bench while he sets up his tripod to the left. While he is preparing, the man gets up and peers into the lens of the camera. The photographer tells him to sit down, he’s ready now, but the man insists on looking through the viewfinder himself. The cameraman goes to the bench, and sits next to the girl while he looks. A boy runs up and ties the man’s legs to the tripod legs, and while he is doing this, the cameraman becomes increasingly affectionate with the girl, who protests at first, but then seems to acquiesce to his attentions. Now, the man tries to approach the bench, but the camera “walks” with him, and the scene ends after a few steps. Judging from imdb’s report of the original Edison catalog entry for this movie, the punchline is missing from the surviving print. According to it, the man behind the camera “makes a wild dash for the photographer, but falls to the ground on top of the camera, smashing it to pieces. The scene ends with the lovers and Reuben all mixed up in a confused mess upon the ground.” Reuben, incidentally, is the generic name for the “rube” character in many early Edison comedies, despite the fact that he was played by different actors in each one. Quite honestly, until I read that description, I wasn’t sure what was supposed to be going on with the kid and “Reuben” walking toward the bench with the tripod. Possibly seeing the ending would have helped. The way I read it, however, was also interesting. It seemed to me as if “Reuben” became so fascinated with looking at the scene through the camera that he lost interest in participating in the dalliance with the girl, and that his approach was meant to signal his desire for a better view as the cameraman kissed his girl. There is still an element of this, since the film audience is also invited in to voyeuristically enjoy the cuckolding of our rube character before his eyes, and to enjoy the transgressive sexuality of the cameraman, without experiencing the consequences of that act. This may not have been the intention, but it is an interesting effect of the film today.